Graptolites were colonial animals that lived from Upper Cambrian through Lower Carboniferous (Mississippian) times. Since the use of electron microscopy was introduced to their investigation in the 1970s, they have been considered to be allied with the pterobranchs, a rare group of modern marine animals belonging in the phylum Hemichordata. Their name was derived from a combination of two Greek words, graptos, meaning "written", and lithos, meaning "rock", because Linnaeus, who described them first, thought of them as images resembling fossils rather than being true fossils. Each graptolite colony has a variable number of branches originating from an initial individual, with each subsequent individual (or zooid) being housed within a tubular or cup-like structure. These fossils are rare in Devonian rocks of south central Oklahoma because they do not survive surface exposure well, and it is likely that grazers and scavengers cleaned up their dead debris. Most of the dendritic or many-branched types, such as those shown here, are classified as dendroid graptolites (order Dendroidea). 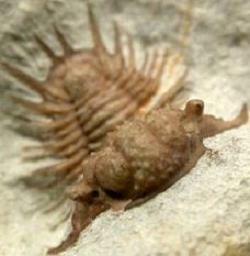 They appeared in the Cambrian period and were generally attached to the sea-floor by a root-like base. Graptolites with relatively few branches were derived from the dendroid graptolites at the beginning of the Ordovician period; and colonies of this latter group (order Graptoloidea) were pelagic, drifting freely on the sea surface or attached to floating seaweed. The Graptoloidea were successful and prolific, being important members of the plankton until they died out in the early Devonian period. The dendroid graptolites survived into Lower Carboniferous times. Their worldwide distribution, rapid evolution and good preservation have allowed graptolite use as index fossils and for division of Ordovician and Silurian rocks into distinct graptolite zones, each less than one million years in duration. According to the entry on Wikipedia, from which I liberally borrowed the information here, graptolites have been used to estimate water depth and temperature. I will follow up on this; as such a correlation may help further refine the conditions in which the rocks of Black Cat Mountain were deposited. Graptolites were rarely reported from Haragan rocks until Bill Rushlau started hunting the area regularly. These delicate fossils are never found on the surface, they weather away too readily. Rather, their uncovering requires breaking a lot of limestone, and their occurrence seems to be rather random. Above are a few that Bill has found. 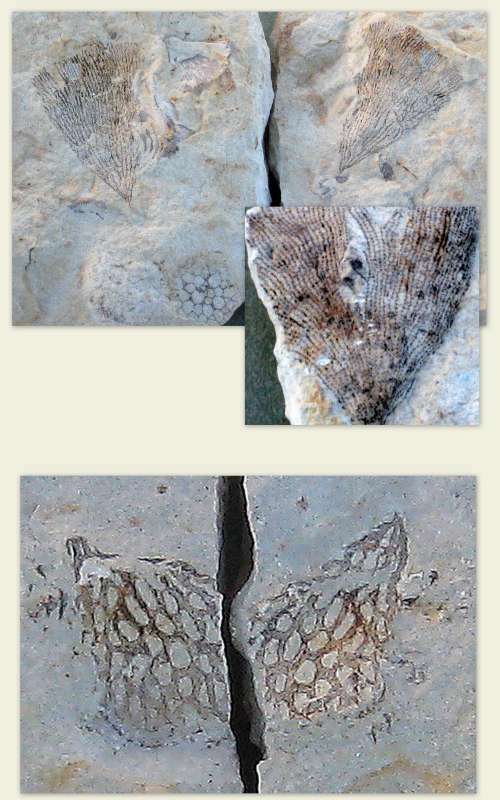 The upper photographs are of a specimen of Ptiograptus delicatissim; the lower photographs are of a Desmograptus sollarsi. These assignments were made by Bill by way of earlier investigations by Allen Graffham. Photographs by G.P. Hansen.